Mike Greene - mgreene@shawmedia.com Nicole Cleeton, of Elmhurst, helps guide Seth Martinez, 10 of Algonquin, while racing during the 5th Annual Run & Roll Track Meet Wednesday, June 6, 2012 at McCracken Field in McHenry. The event included participants of all ages with physical and visual disabilities and introduced the county to paralympians Patrick Byrne and Sheila O'Neil. 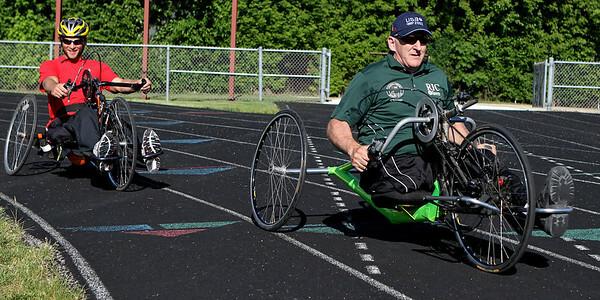 Mike Greene - mgreene@shawmedia.com Bob Swanson, of Round Lake, pushes his cycle while competing during the 5th Annual Run & Roll Track Meet Wednesday, June 6, 2012 at McCracken Field in McHenry. The event included participants of all ages with physical and visual disabilities and showcased various adaptive sports equipment. Mike Greene - mgreene@shawmedia.com Amanda Malawski, 11 of Sugar Grove, runs around the track while competing during the 5th Annual Run & Roll Track Meet Wednesday, June 6, 2012 at McCracken Field in McHenry. The event included participants of all ages with physical and visual disabilities and introduced the county to paralympians Patrick Byrne and Sheila O'Neil. Mike Greene - mgreene@shawmedia.com Ethan Martinez, 10 of Algonquin, participates in the discus during the 5th Annual Run & Roll Track Meet Wednesday, June 6, 2012 at McCracken Field in McHenry. Martinez, who is blind, was one of 25 individuals that took part in the event which included participants of all ages with physical and visual disabilities. Mike Greene - mgreene@shawmedia.com Rich Martinez and Dave Dauphin help guide Ethan Martinez, 10 of Algonquin, while trying out a roller hockey system before the 5th Annual Run & Roll Track Meet Wednesday, June 6, 2012 at McCracken Field in McHenry. The event included participants of all ages with physical and visual disabilitie. 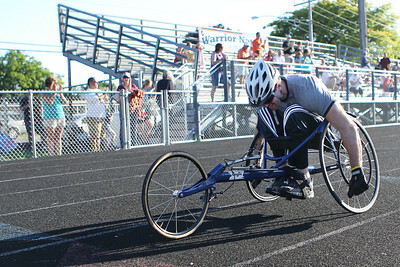 Mike Greene - mgreene@shawmedia.com Adam Finney (left) rides behind Patrick Byrne, a member of the gold-medal winning U.S. Sled Hockey team from the 2002 Paralympic Games, while showing off hand cycles before the 5th Annual Run & Roll Track Meet Wednesday, June 6, 2012 at McCracken Field in McHenry. The event included participants of all ages with physical and visual disabilitie. 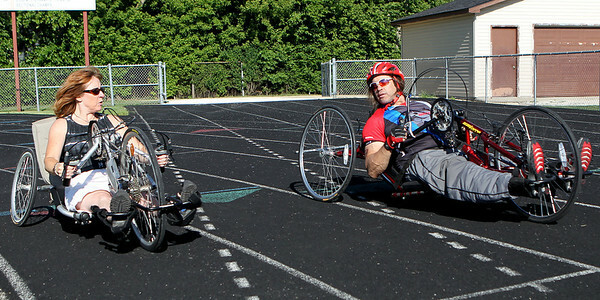 Mike Greene - mgreene@shawmedia.com Paralympic athlete Sheila O'Neil talks with Mike Napp while trying out a hand cycle before the 5th Annual Run & Roll Track Meet Wednesday, June 6, 2012 at McCracken Field in McHenry. The event included participants of all ages with physical and visual disabilitie. Mike Greene - mgreene@shawmedia.com Ben Spengel (left), 15 of McHenry, and Zachary Simons, 13 of Huntley, race during the 5th Annual Run & Roll Track Meet Wednesday, June 6, 2012 at McCracken Field in McHenry. The event included participants of all ages with physical and visual disabilitie. 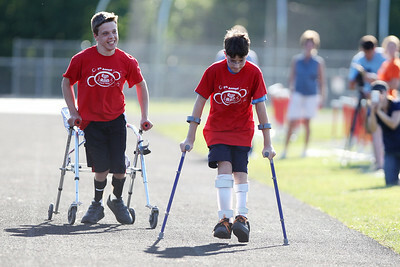 Mike Greene - mgreene@shawmedia.com Sarah Iuorio, of Palatine, helps guide Ethan Martinez, 10 of Algonquin, while racing during the 5th Annual Run & Roll Track Meet Wednesday, June 6, 2012 at McCracken Field in McHenry. The event included participants of all ages with physical and visual disabilitie. 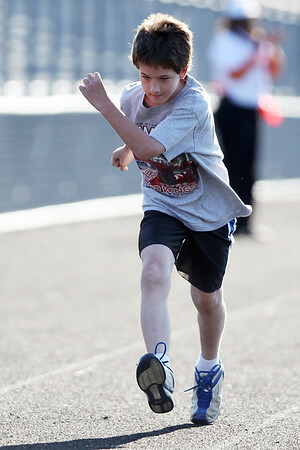 Mike Greene - mgreene@shawmedia.com Samuel Reiter, 11 of Cary, races during the 5th Annual Run & Roll Track Meet Wednesday, June 6, 2012 at McCracken Field in McHenry. The event included participants of all ages with physical and visual disabilitie. Mike Greene - mgreene@shawmedia.com Nicole Cleeton, of Elmhurst, laughs while speaking with Sarah Iuorio (left), of Palatine, after the pair helped Ethan (left) and Seth Martinez, both 10 of Algonquin, race during the 5th Annual Run & Roll Track Meet Wednesday, June 6, 2012 at McCracken Field in McHenry. The event included participants of all ages with physical and visual disabilitie. 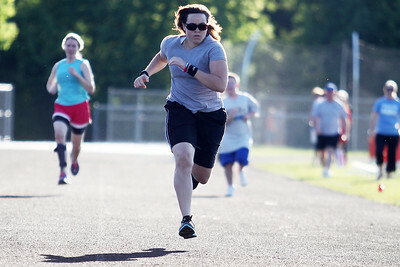 Mike Greene - mgreene@shawmedia.com Tiffany Melchiorre, of Waukegan, races during the 5th Annual Run & Roll Track Meet Wednesday, June 6, 2012 at McCracken Field in McHenry. The event included participants of all ages with physical and visual disabilitie. Mike Greene - mgreene@shawmedia.com Aaron Holzmueller, 12 of Evanston, runs in the 800-meter competition during the 5th Annual Run & Roll Track Meet Wednesday, June 6, 2012 at McCracken Field in McHenry. The event included participants of all ages with physical and visual disabilitie. 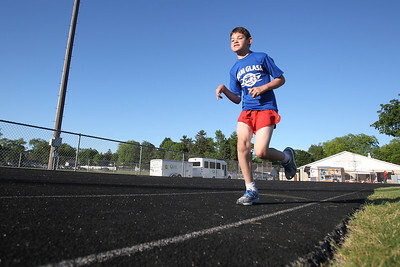 Aaron Holzmueller, 12 of Evanston, runs in the 800-meter competition during the 5th Annual Run & Roll Track Meet Wednesday, June 6, 2012 at McCracken Field in McHenry. The event included participants of all ages with physical and visual disabilitie.